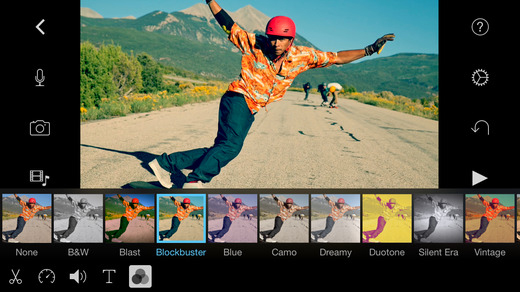 While iOS 8 compatibility is the first item on Apple's release notes for iMovie version 2.1, the updated consumer-level video editing app brings a number of new features like filters and support for iCloud Drive. With version 2.1, video clips can be edited in the new iOS 8 Photos app by using the iMovie extension, making available an extra set of tools for tweaking and image enhancement. In addition, ten Apple-designed filters now come prepackaged for application in a single clip or across an entire movie. Post-processing speed controls now allow users to slow down, speed up or freeze sections of a clip for dramatic results. While slow-motion and freeze frames are supported in older iOS devices, Apple notes users must have at least an iPhone 5s, iPad Air or iPad mini with Retina display to apply 2x speed-up effects. Video storage and sharing options have been extended to include compatibility iCloud Drive and sending to other apps on an iOS device. Finally, iMovie version 2.1 includes title creation using bi-directional text and added support for Arabic, Australian English, Hebrew, and Mexican Spanish. iMovie is available to new device owners as a free 643MB download from the iOS App Store, while those with older iPhone, iPad and iPod touch models can purchase the video editor for $4.99.